This is a common Windows problem witnessed by many while trying to format hard disk or any external storage device like USB or pen drive. 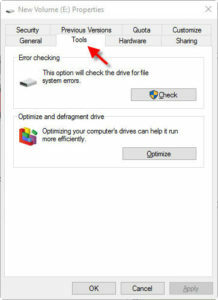 This blog guides you through the solutions to fix such Windows drive formatting errors issues. Usually drive formatting is performed to prepare the drive for reuse by deleting all data on it. When you format a hard drive partitions or external drive like USB, pen drive etc., the files and folders on them become inaccessible and a new file system is created. You can save afresh data in the drive. 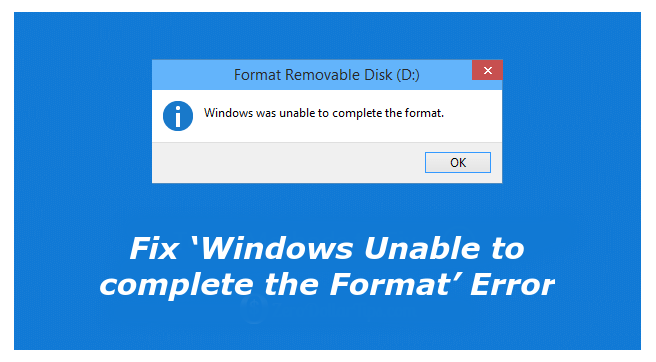 Why Windows fail to format your drive? How to format the virus infected drive? To format the virus infected drive, use an effective antivirus software. Download, install, run, and scan the drive using antivirus. It will detect and remove any malware in the drive. Once the antivirus solution is removed the detected virus, attempt formatting the drive again. How to format drive with bad sectors? 1. Visit the Search box of your system, type This PC >click This PC. 2. 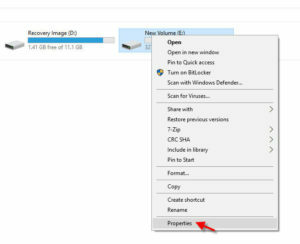 Select the drive to be repaired > Right-click the drive >Click Properties. 4. Under Error checking, click Check. 8. Once the bad sectors of the drive are repaired, format it with the usual process. How to format Write Protected drive? Sometimes external storage devices like pen drives, USB flash drives or SD cards are write protected to prevent data loss by denying delete or format decisions. Thus, an error message ‘disk is write protected’ appears when you try to format them. 2. Navigate to the following key: Computer\HKEY_LOCAL_MACHINE\SYSTEM\CurrentControlSet\Control\StorageDevicePolicies. Figure 3: Illustrates the Registry Editor window. 4. 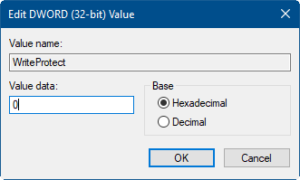 In the Edit DWORD box, change Value data from 1 to 0, click OK.
5. Now close Regedit and restart your system. Again connect your USB flash drive or pen drive to format it as usual. How to fix write protection error of SD memory card? On the side of SD card is a lock switch, slide it up to unlock position. This will remove write protection and you will be now able to format the memory card. Can you recover data from a formatted drive? Although formatting visibly erases all data on the drive, creating an empty disk, technically the data is still present but made inaccessible. Unless you rewrite new data over it, you can recover lost files and folders from a formatted drive using a third-party tool. If the formatted drive contained an important data that you need back, do not rewrite it. Even the third-party Windows drive recovery software cannot recover lost data from a formatted rewritten drive. Stellar Phoenix Windows Data Recovery – Home is a cost effective way to recover data from formatted, corrupt, inaccessible hard drives partitions, pen drives, USB flash drives, or other storage media. It is an easy-to-use data recovery solution for personal users with just 1 GB minimum memory and 50 MB of free space requirement. Whatever the reason for your Windows drive formatting errors, be it a virus infection, bad sectors on the drive, or disk write protected, try the above manual fixes to resolve the issue. These methods successfully work for formatting of any drive including hard disk partitions, pen drive, USB flash drive, SD card, SSD, CDs or DVDs. Since drive formatting removes all data, be sure to backup your important files. If you have not, only a third-party software like Stellar Phoenix Windows Data Recovery – Home can come to your rescue. Daily Mag is best information sharing platform that cover the different topics like, Tech, Travel, Finance, Business, Health, Lifestyle etc. Daily Mag provide you with the latest news. We maintain a keen interest in progress business development strategies and development in the marketing and business.We wanted a place for contributors to raise their visibility. Online Story is Bloggers Outlet to Write & Share Unique Information and reviews to help internet readers with knowledge. This platform present your ideas, thoughts, and your work. Get an exposure to show your innovation to an entire world. We wanted a place to contribute to the knowledge base to be a part of the conversation. Daily Mag is best information sharing platform that cover the different topics like, Tech, Travel, Finance, Business, Health, Lifestyle etc. Daily Mag provide you with the latest news. We maintain a keen interest in progress business development strategies and development in the marketing and business. We wanted a place for contributors to raise their visibility. Want to become a contributor at Online Story? If so, OS invite you, Read guidelines before sharing your piece of content. The team carefully review all applications and if your application accepted then you will receive a welcome Email within 24 hours. Anyone can easly contact us via Email for become a contributor: digitalexperts17@gmail.com. Online Story is Bloggers Outlet to Write & Share Unique Information and reviews to help internet readers with knowledge. This platform present your ideas, thoughts, and your work. Get an exposure to show your innovatin to an entire world. We wanted a place to contribute to the knowledge base to be a part of the conversation.